Skittles chewy sweets have always been a favourite of mine. I love their juiciness without the teeth breaking crunch that Tootie Fruities have that can scare the older folks like me, and my multitude of fillings and brittle teeth. Of course Skittles do have a crunch of their own and do get stuck in my teeth, but that's why I have an old Boy Scout penknife with a toothpick! These Skittles new Wild Berry flavour came in five flavours, which are supposed to be; Raspberry, Strawberry, Wild Cherry, Berry Punch & Melon Berry flavour (Melons would make very big berries) Skittles. Red tasted like a blend of strawberry and raspberry, and were very nice. There were loads of them in the packet too. Green was a very fruity apple flavour with a hint of melon. Not very berry-like, but certainly very tasty. Dark Orange, well, red with orange speckles tasted citrusy like orange mixed with grapefruit. These were also very tasty, but I was getting a little confused by the Wild Berry name on the front of the packet. Blue was a very heavy yet almost natural blueberry just a little bit sweeter, but nonetheless we were back to the Wild Berry topic. The last flavour was Purple, which was black cherry flavour. Regular readers will know that cherry sweets are a worst enemy of mine where sweet flavours are concerned. Having said that, I'm sure someone who does like black cherries would like these purple Skittles. 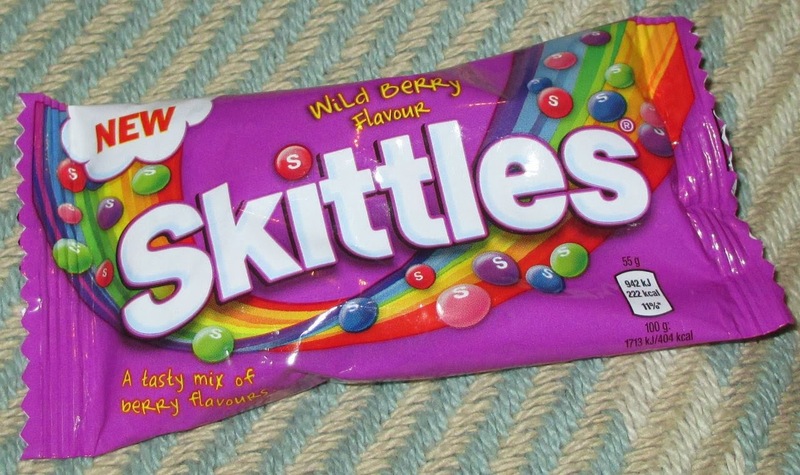 Having said that, the purple flavour was my least favourite, but I did enjoy all these Skittles and would have them again. I'd just have to palm off the purples to someone... Cinabar? 55g packet with 222 calories, 2.3g of fat and 49.6g of sugar. Ingredients included; sugar (no surprise there), glucose syrup, palm fat, citric acid, dextrin, maltodextrin, flavourings, modified starch, acidity regulator trisodium citrate, glazing agent carnauba wax, emulsifier soybean lecithin, and a bunch of E-numbers. I also dislike the purple ones and are pretty sure that there will be quite a few other people who do too. Maybe we should let Wrigley's know that the purple has got to go! A berry is a fruit which contains a seed on the inside so actually raspberry & strawberries aren't berries at all. Not only that, but the Melon definitely qualifies as a Berry. You are right - cherry does have a tendency to be similar to marzipan, and these are a good example of that. (Yes, he did try and palm them off on me).